I have a bit of a thing for little mini mousse cups. Mini always makes everything cuter.....and when I found these super sweet little disposable square verrine cups I knew I had to use them on my next dessert table. 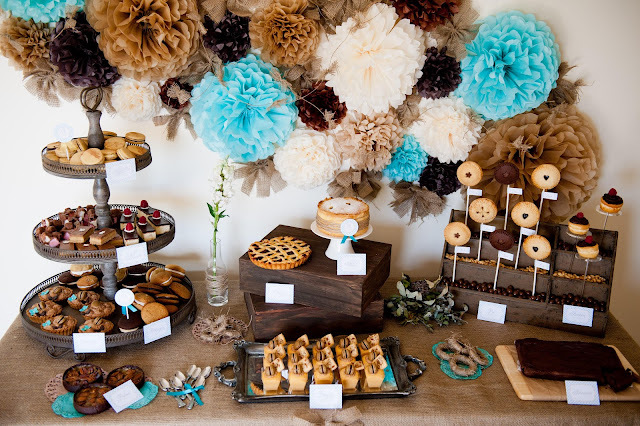 Ok who am I kidding, I want to use them on EVERY dessert table I ever do from now on cause they are sooo cute. Anyway as my next planned table after I picked up the cups was a pie and slice table I came up with an idea to make some chiffon pie mousse cups. They worked out pretty well, rather than layering different flavors I just made the one type of mousse and then added extra flavor and texture with the garnish. It meant I could make all the components in advance and then I just assembled on the spot to ensure maximum crunchiness for the pie bites and macarons. It was something new for me and I didn't have a recipe handy so I found some on the internet, tried out a few, threw out quite a few icky batches and then finally tweaked this recipe I found here. The gorgeous photography is by Naomi V Photography. at her studio. Printables are by Style Me Gorgeous. 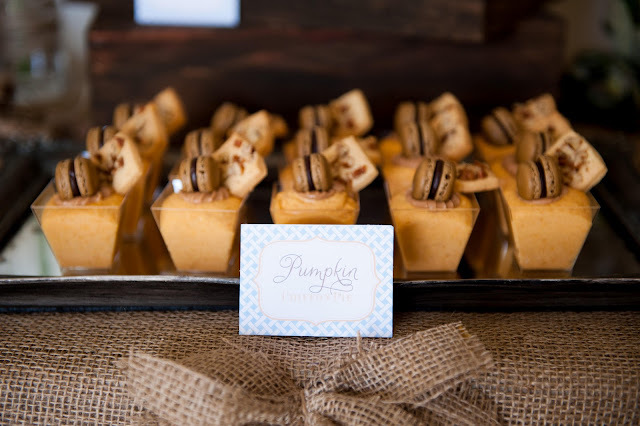 Pumpkin Chiffon Pie Mousse with mini macarons and pecan pie crust bites were created for the Blissfully Sweet Oh Sweet Mum E-vent for this rustic pie table...more pictures of the pie table available in the online E-Zine or here on the Bubble and Sweet Blog. Ah-Tissue created the amazing display of paper and hessian wall pom poms. In a heavy based saucepan at medium low heat cook the yolks, sugar and 1/2 cup cream whisking continuously until the mixture thickens enough to coat the back of a spoon. Remove from the heat and mix in the pumpkin, cinnamon, nutmeg and vanilla. Place in the fridge to chill for around an hour. Place the 1 1/2 cups cream in a large bowl and beat until stiff peaks form. Mix in 1/3 of the pumpkin mixture with a spatula to lighten the mixture. Add the remaining pumpkin mixture to the cream mixture and gently fold in until combined. Place the mixture into a large disposable piping bag (I use biggish kee-seal ones). 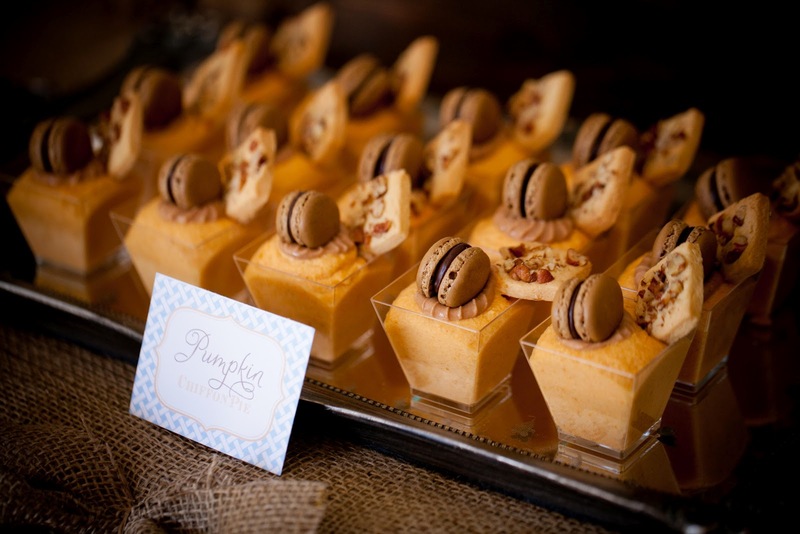 Line up the mini mousse cups (or what ever type of container you are using) on a large tray. Snip off the end of the piping bag with scissors and squeeze the mixture into the cups until it nearly reaches the top. Place the tray in the fridge and chill overnight or until set. Best prepared day before serving although you can prepare a few days ahead and store in an airtight container in the fridge. I decorated the mousse cups with mini macarons and Pie bites. To make the pie bites roll out some chilled sugar crust pie dough or vanilla sugar cookie mixture. Cut into small squares around 3cm (1"), place on trays lined with parchment paper and press chopped pecans into the dough. Bake at the recommended oven setting until golden and allow to cool before using (can be prepared around 3 days ahead). 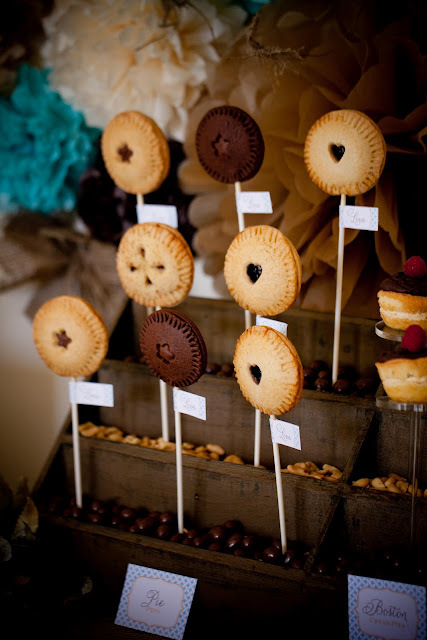 I used the sugar crust pie dough from my book Sweets on a Stick, It's the same recipe I use for the pie pops. But you can just use store bought or even this sugar cookie dough recipe CLICK HERE. 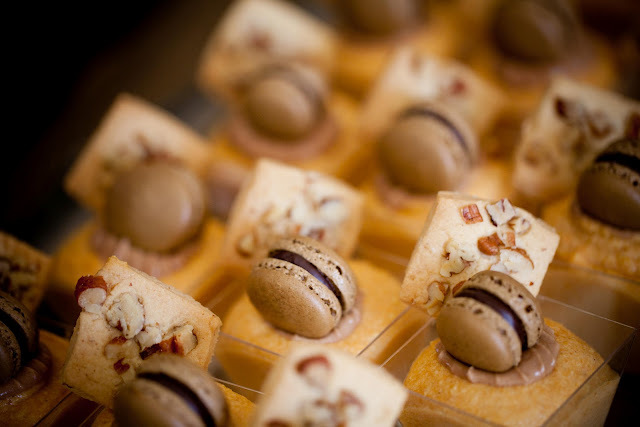 To make mini macarons you can follow this recipe CLICK HERE and just pipe the macarons smaller. I popped this on Skip to my Lou's Linky Made by you Monday. Again, I am in LOVe with those mini macs on this delicious looking mousse. what a cute idea. What an amazing setup. The mini mousse cups are adorable! The mini macarons and pie pops are so sweet and charming! Where did you get the little cups from lovely? They are adorable! My godness, everything looks delicious. Love the mini macarons! 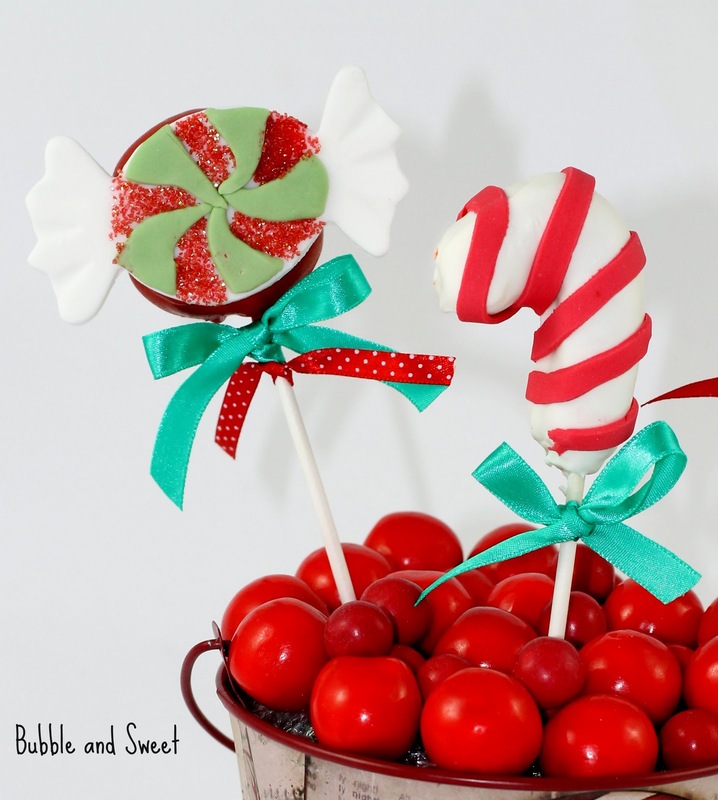 We would love for you to share this on our Kitchen Fun and Crafty Friday link party...just posted it! Thanks!